Queen Elizabeth II (b. 1926) is the only person in Britain who can drive without a license or number plate on her state car. According to British law, the Queen does not need a driving license because driving licenses are issued in her name. She is the Sovereign. The 92-year-old has been driving since she was 19. She was then titled Princess Elizabeth. 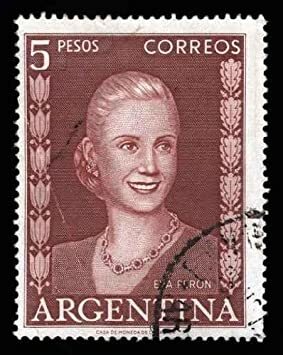 She had not yet been crowned (that happens in 1953 at age 27), and the BBC reports that she did indeed, in 1945, have a driving license. She learned to drive at a training center at the wartime Auxiliary Territorial Service. Known as Second Subaltern Elizabeth Windsor, she trained in London as a mechanic and military truck and ambulance driver. 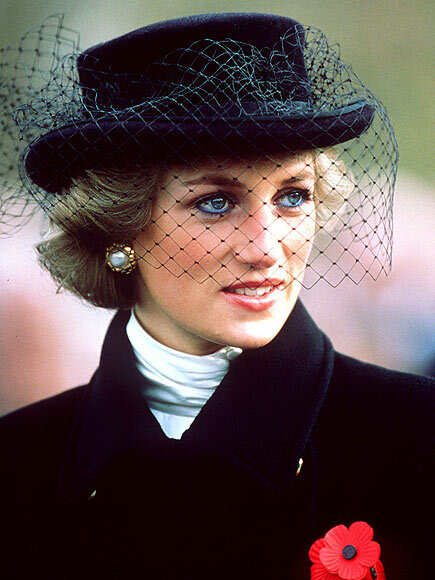 She is the only female member of the royal family to have entered the armed forces and is the only living head of state who served in World War II. Nowadays, she primarily drives around her Balmoral, Sandringham, and Windsor estates rather than on the streets of London, where she is definitely chauffered, as is the protocol. Her passion for driving is well-documented in photos of her behind the wheel. 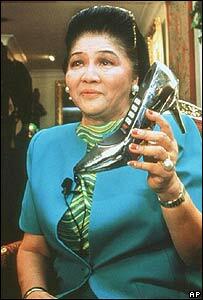 In 1998, Queen Elizabeth had a great “Gotcha” moment. Prince Abdullah — then the crown prince and de facto ruler of Saudi Arabia — was visiting Balmoral, the Queen’s estate in Scotland. After lunch, the Queen had asked her royal guest whether he would like a tour of the estate. Abdullah agreed. The royal Land Rovers were pulled up in front of the castle. The Crown Prince climbed into the front seat of the front Land Rover. His interpreter sat in the seat behind. To Abdullah’s surprise, the Queen climbed into the driving seat, turned the ignition, and drove off. Women, at the time, were not allowed to drive in Saudi Arabia, and Abdullah was not used to being driven by a woman, let alone a queen. Evidently, the Queen drove like the wind, navigating the narrow Scottish estate roads, talking all the while, and accelerating. Abdullah was terrified. He begged the Queen to slow down and concentrate on the road ahead. On January 17, Prince Philip of England, aka the Duke of Edinburgh, was involved in a two-car collision near the Sandringham Estate in Norfolk. 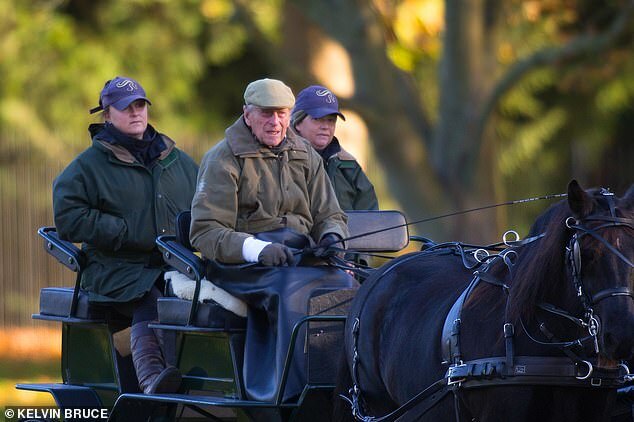 Although he was accompanied by a female driver, Prince Philip was behind the wheel and bears the responsibility for the accident. Philip, 97, driving a black Land Rover, pulled onto the busy A149 and was T-boned by a black Kia carrying two women and a baby. The Land Rover rolled onto its side and Philip was pulled to safety through the 4 x 4’s sunroof as it lay on is side. He was shaken but conscious and unhurt. Two people in the Kia were treated for minor injuries. One witness said the Kia was smoking and looked as if it might explode. Philip explained that he was dazzled by the winter sun and, apparently, did not see the oncoming Kia. For photos and more, see The Daily Mail. As I mentioned in my blog post, “Prince Philip’s Mum had a Habit,” Prince Philip of the United Kingdom, known as the Duke of Edinburgh, the Prince Consort of Queen Elizabeth II, was born in 1921 on a kitchen table in Corfu, Greece, in a house that had no electricity or running water. But Philip was not of peasant stock. He was Prince Philip of Greece, born into a royal family with ties to German, British, Dutch, Russian, and Danish royal houses. Oddly enough, however, neither Philip’s parents nor his four beautiful sisters had a drop of Greek blood in them. Yet they were a branch of the Greek Royal Family. Prince Philip’s mother was Princess Alice of Battenberg. Alice’s great grandmother, Queen Victoria of England, had been present at her birth in the Tapestry Room at Windsor Castle in England. Philip’s father, Prince Andrew of Greece and Denmark, had been born in Athens, Greece. 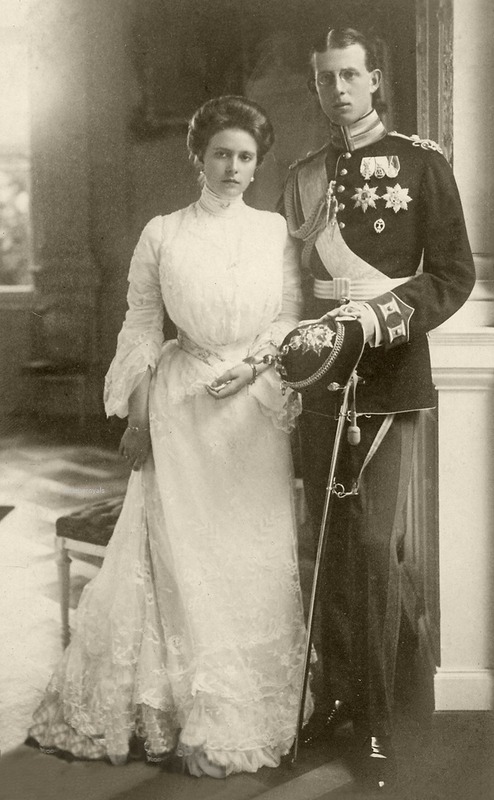 The two married in 1903 in Germany, the native country of Princess Alice’s parents. Head spinning yet? There’s a reason Queen Victoria of England is called “the grandmother of Europe.” Her descendants fanned across the continent. She and other royal matriarchs and patriarchs were quite the matchmakers, shoring up old alliances and creating new ones, through arranged royal marriages. This proved to be a problem both health wise (hemophilia) and when European countries found themselves warring with one another, especially during both World War I and II, pitting blood relatives against one another in deadly warfare, a confusion of loyalties. But I digress. My goal today is to shed some light on Princess Alice (1885-1969) and her struggle with mental illness. Alice was born with a large disadvantage in life: she was deaf. She learned to lip read and speak English and German. 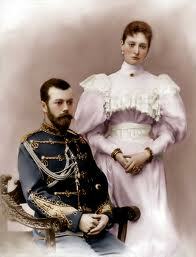 She studied French and, after her engagement to Prince Andrew, began to learn Greek. 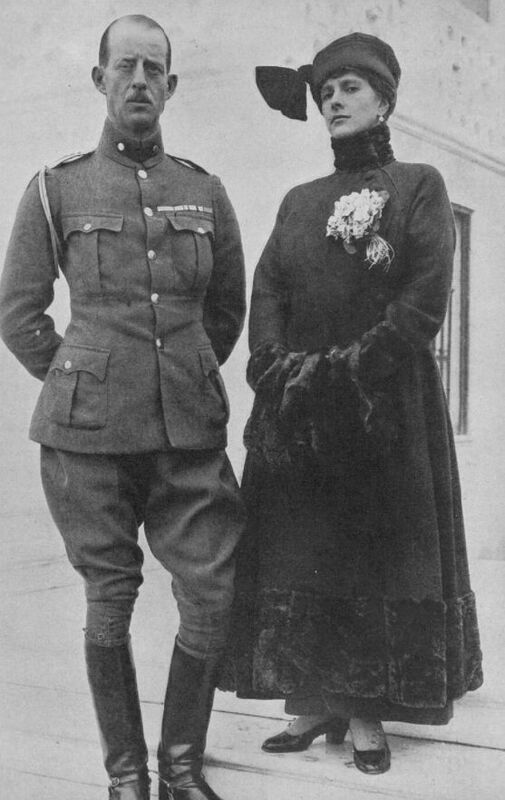 Her husband, Prince Andrew (1882-1944), a military man, was a polyglot. 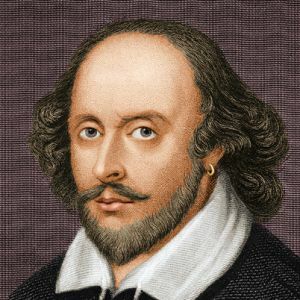 His caretakers taught him English as he grew up, but he insisted upon speaking only Greek with his parents. He also spoke Danish (his father was originally a Danish prince), French, German, and Russian (his mother was Russian—a Romanov). Alice had spent her early years between her family homes in England and Germany whereas Andrew’s roots were in Denmark and Russia. She was Lutheran, although others say she was Anglican. He was Greek Orthodox. Andrew—known to his friends and family as “Andrea”—had hoped that he and his new bride Alice could settle down permanently in Greece. From the beginning of their marriage, though, Prince Andrew and his family’s safety within Greece waxed and waned. The Greek political situation was always unstable. Prince Andrew fell in and out of favor with the reigning political parties. One moment he was forced to resign his army post and then, in 1912 during the Balkan Wars, he was reinstated. It was during the Balkan Wars that Princess Alice—sometimes referred to as “Princess Andrew”—acted as a nurse, assisting at operations and setting up field hospitals, work for which King George V of Great Britain awarded her the Royal Red Cross in 1913. The next day, Alice’s mother’s lady-in-waiting, Nona Kerr, arrived in Greece. She went to see Alice. Nona then wrote a letter to Alice’s mother, telling her how Alice seemed. Nona wrote to Victoria that it “would make you proud to hear the way everyone speaks of Princess Alice. Sophie Baltazzi, Doctor Sava, everyone. 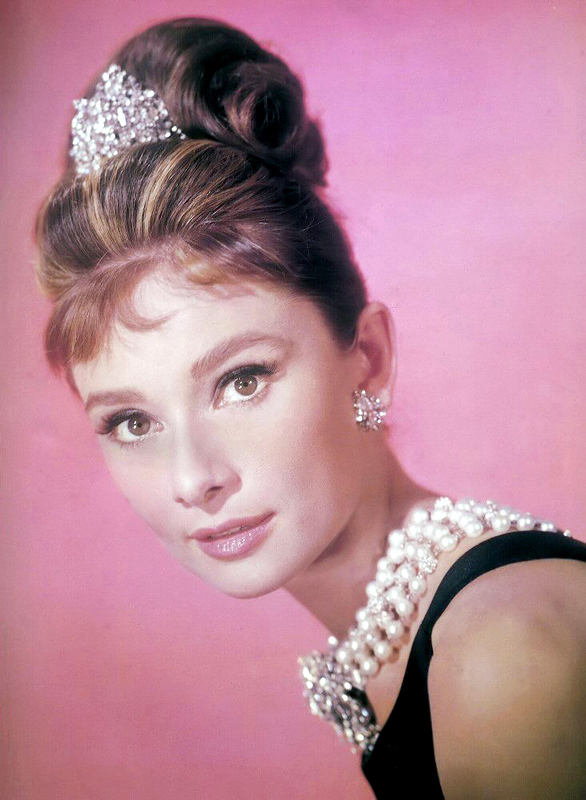 She has done wonders.” She also noted that Alice was “very thin…At present she simply can’t stop doing things. 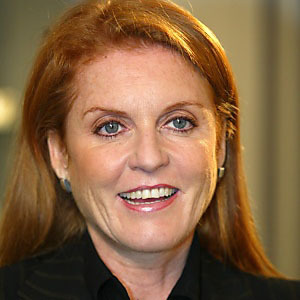 Prince Andrew wants to send her back to Athens to the babies [Alice and Andrew had three daughters by then: Margarita (b. 1905), Theodora (b. 1906), Cécile (b. 1911)] soon, but I don’t think he will succeed just yet….” Alice was suffering from mania, probably triggered by sleep deprivation, hunger, cold, exposure, and PTSD. During the war, Andrew’s father was assassinated and he inherited a villa on the island of Corfu, Mon Repos. The family moved there. In June of 1914, Alice gave birth to a fourth daughter, Sophie. One month later, World War I broke out across Europe. 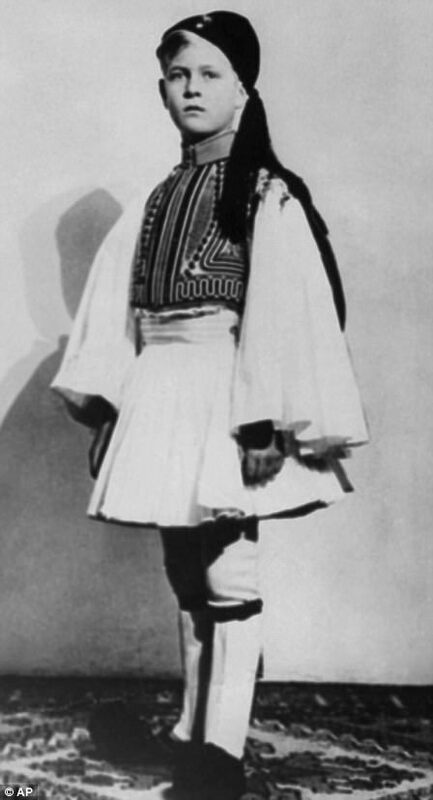 Andrew’s brother, King Constantine of Greece, declared the neutrality of his country. However, the Greek ruling party sided with the Allies. During the war, Prince Andrew, unwisely, made several visits to Great Britain, one of the Allied countries. Rumors circulated in the British House of Commons that Andrew was a German spy. This stirred up suspicions in Greece. Was Prince Andrew indeed a spy for the Central Powers? Prince Andrew and Princess Alice of Greece, 1916. Note Prince Andrew’s right eye monocle. By 1917, the whole Greek royal family was forced to flee Greece, as they were suspected of consorting with the enemy. Most of the Greek royals, including Alice and Andrew and their family, took refuge in Lucerne, Switzerland. At the end of the war, in July of 1918, Alice’s two maternal aunts, Tsarina Alexandra (Alix) and the Grand Duchess Elizabeta Feodorovna (Ella), were killed by the Bolsheviks in the Russian Revolution. So much suffering and tragedy, living in constant fear, doomed to exist in a world devoid of sound, living here, traveling there, led Alice to seek comfort in mystic religion. Together with her brother-in-law Christo, they performed automatic writing, a precursor to the use of a ouija board to receive supernatural messages from the spirit world. Alice was superstitious. She was often seen dealing herself cards and getting messages from this, especially when she had important decisions to make. She continued to read books on the occult. After three years in Swiss exile, the political situation in Greece became more favorable to the Royals. In 1920, the Greek Royal family was invited to return home. Prince Andrew and Princess Alice happily re-established themselves and their family in their peaceful villa, Mon Repos. But the country was still in turmoil. Greece was embroiled in another regional military conflict, The Greco-Turkish War, AKA The Asia Minor Campaign. Prince Andrew was put in command of The II Army Corps. All of this instability had transpired before their son Prince Philip was born on June 10, 1921, at Mon Repos. Prince Andrew was not present for his first son’s birth as he was on the battlefield. 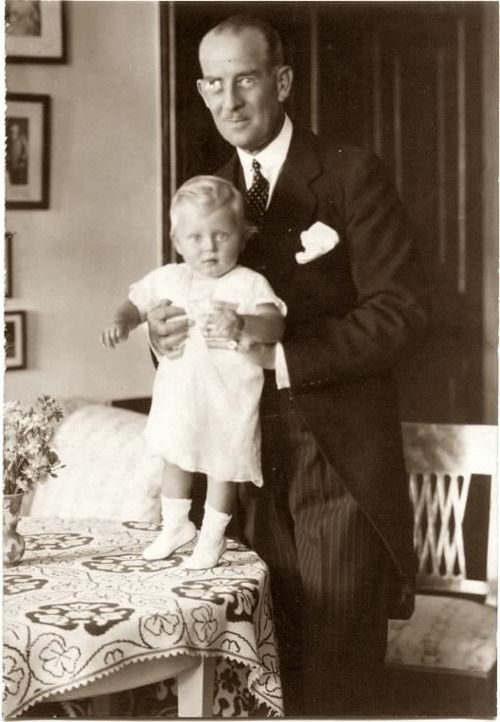 Prince Andrew of Greece and Denmark holds his fifth child and only son, Prince Philip of Greece, born June 10, 1921. The Greek defeat in Asia Minor in August 1922 had led to the September 11, 1922 Revolution, during which Prince Andrew was arrested, court-martialed, and found guilty of “disobeying an order” and “acting on his own initiative” during the battle the previous year. Many defendants in the treason trials that followed the coup were shot by firing squad and their bodies dumped in holes on the plains at Goudi, below Mount Hymettus. 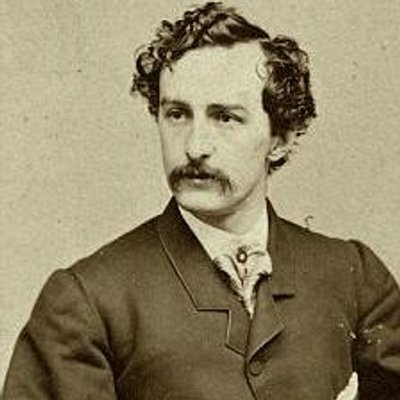 British diplomats assumed that Andrew was also in mortal danger. They called upon King George V of England to act. However, King George V refused to risk inflaming the situation further, causing an international incident, by allowing Andrew to settle in London. In December of 1922, he sent the British cruiser, HMS Calypso, to ferry Andrew’s family to France. Andrew, though spared the death sentence, was banished from Greece for life. Eighteen month-old Philip was transported in an improvised cot made from an orange crate. The family settled at Saint-Cloud on the outskirts of Paris, in a small house loaned to them by Andrew’s generous sister-in-law, Princess Marie Bonaparte, AKA Princess George of Greece. Andrew and his family were stripped of their Greek nationality, and traveled under Danish passports. Alice and Andrew celebrated their silver wedding anniversary on October 8, 1928. Each member of the family had made it a point to be at Saint Cloud that beautiful autumn day so they could commemorate the special event with a group photograph in the garden. 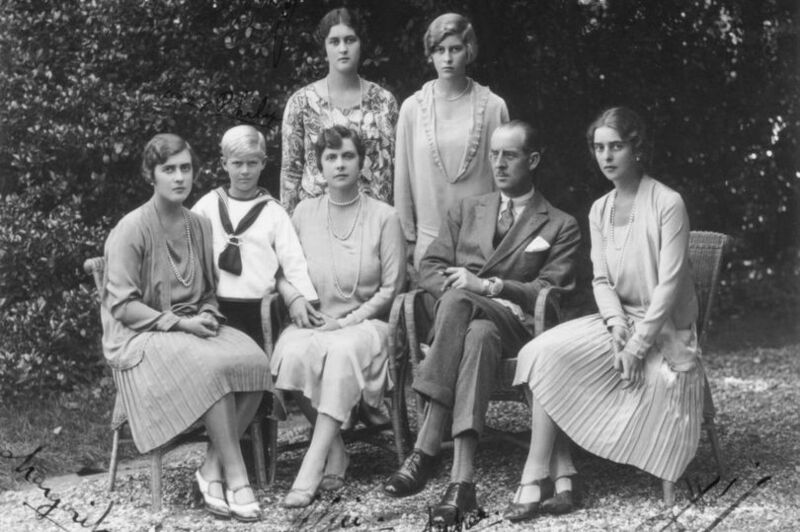 Prince Philip poses with his family for a photograph to mark his parents’ silver wedding anniversary in October of 1928. A young Philip stands to the right of his mother, Princess Alice, and father, Prince Andrew of Greece and Denmark. From left to right are Philip’s sisters, all Princesses of Greece & Denmark: Margarita, Theodora, Sophie, and Cecilie. Five years into exile, the family of six often found themselves more apart than together, traveling a lot, scattered across the European continent, staying with relatives, enjoying the London social season, on holiday, or attending a royal funeral or wedding. It was an idle life which had no real purpose. Andrew and Alice’s mother Victoria summoned Alice’s gynecologist who diagnosed her psychosis. Her sister-in-law the French Princess Marie Bonaparte, a great friend of the famous psychoanalyst Dr. Sigmund Freud, arranged for Alice to see one of Freud’s former co-workers, the psychoanalyst Dr. Ernst Simmel, just outside Berlin. Dr. Louros accompanied Alice in her journey and she was admitted to Simmel’s clinic. Dr. Simmel diagnosed Alice as “paranoid schizophrenic” and said she was suffering from a “neurotic-prepsychotic libidinous condition” and consulted Freud about it. Freud advised “an exposure of the gonads [ovaries] to X-rays, in order to accelerate the menopause,” presumably to calm her down. Was Alice consulted about this? Probably not. The treatment was carried out. Alice did not improve. On May 2, 1930, she was involuntarily committed at the Bellevue private psychiatric clinic at Kleuzlingen in Switzerland. This event marked the end of their once-close family life. Though they did not divorce, Alice and Andrea’s marriage was effectively finished. Andrew closed the family home at Saint-Cloud and disappeared, moving to the South of France, where he frittered away his life drinking, gambling, and womanizing. 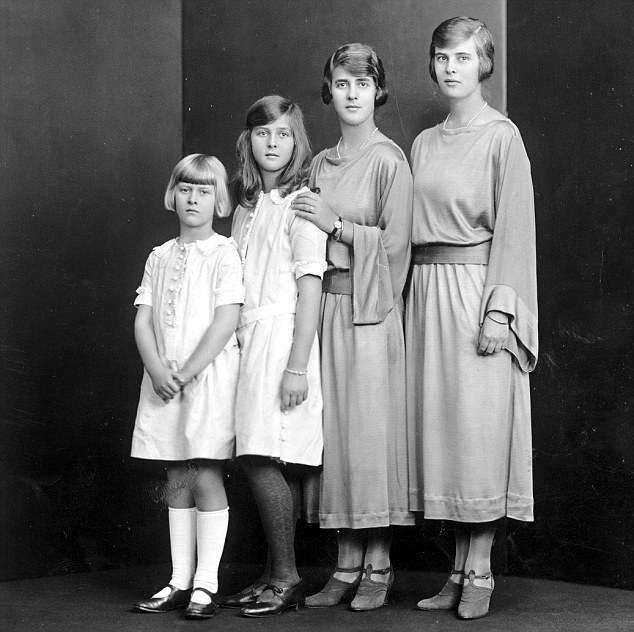 The girls were ages 16, 19, 24, and 29, and would all be married by 1932, so they were less affected by the fallout of their mother’s breakdown and their father’s abdication of his family role. Unfortunately, two of the girls ended up marrying German Nazis. Philip, though, was only nine years old when his mother was institutionalized and his father abandoned him. Philip would have little contact with his mother for the rest of his childhood which was spent living with his mother’s relatives in England and in attending boarding schools in England, Germany, and Scotland. Footnote: Philip’s aunt, Princess Marie Bonaparte, who had arranged for Princess Alice to be treated by Freud and his colleague, was very wealthy and influential. Her mother had owned the casino in Monte Carlo and Princess Marie had inherited this money. As you will remember, Marie had very generously provided Alice and Andrea with their house at Saint Cloud. 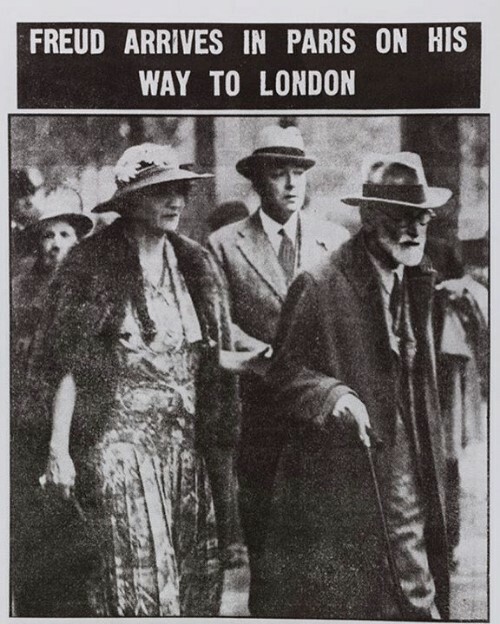 In 1938, Princess Marie Bonaparte paid the Nazis a ransom of 12,000 Dutch guilders to allow Dr. Sigmund Freud and his family the freedom to leave Vienna and move to London. The Nazis were rounding up and killing both Jews and psychoanalysts and Freud was a Jewish psychoanalyst. 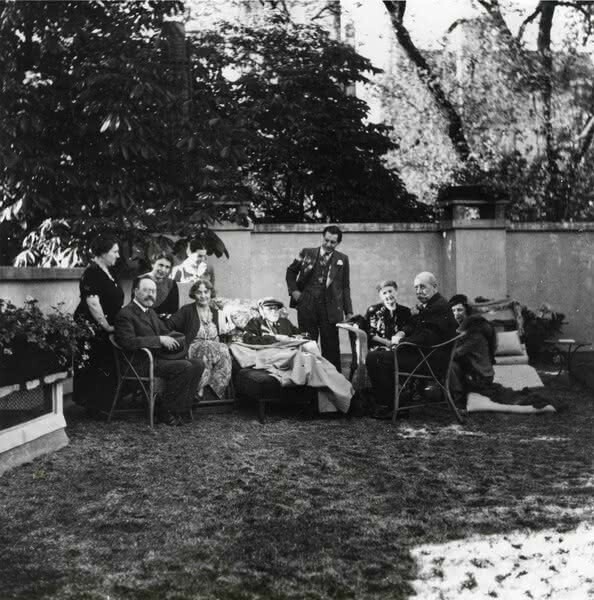 The Freud family relaxes in the garden at Princess Marie Bonaparte’s home in Saint-Cloud, France. June 5, 1938. Freud is lounging as he is deathly ill with oral cancer. He smoked 20 cigars a day. Freud spent his first day of freedom in Marie’s gardens in Saint-Cloud before crossing the Channel to London, where he lived for his last 15 months. A few weeks later, Princess Bonaparte traveled to Vienna to discuss the fate of Freud’s four elderly sisters left behind. Her attempts to get them exit visas failed. All four of Freud’s sisters would perish in Nazi concentration camps. Readers, for more on the European Royal Families here on Lisa’s History Room, click here. To read more about Prince Philip and Princess Alice, click here. Eade, Philip. Prince Philip: The Turbulent Early Life of the Man Who Married Queen Elizabeth II. Vickers, Hugo. Alice: Princess Andrew of Greece. Prince Philip and his wife, Queen Elizabeth II of England, are both direct blood descendants of Queen Victoria of England. They are both her great great grandchildren. 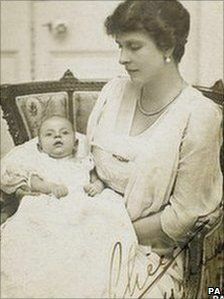 Prince Philip’s mother, Princess Alice of Greece, was born at Windsor Castle with her great grandmother Queen Victoria present. Prince Philip and Queen Elizabeth II are related in four different ways. 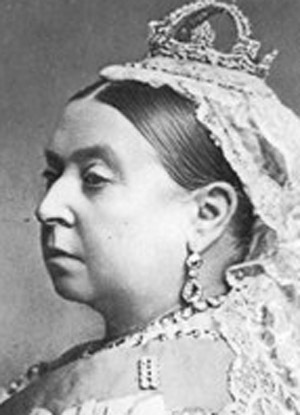 Through their connection to Queen Victoria, they are third cousins. Wonderful Readers: For more posts on the British Royal Family here on Lisa’s History Room, click here. Frida in New York, 1946, photo by Nickolas Muray. Brooklyn Museum; Emily Winthrop Miles Fund, 2010.80. 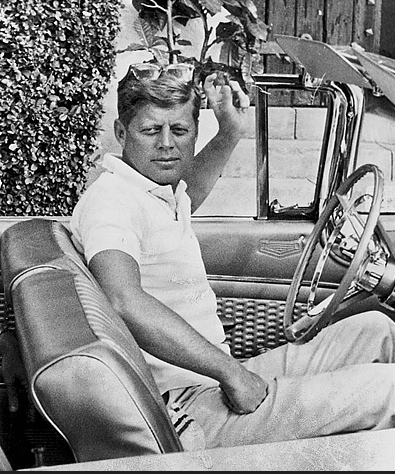 © Nickolas Muray Photo Archives. Brooklyn Museum, New York, U.S.A. The museum is charging a separate admission for the Kahlo show of $20 to $25, depending on the day. The museum will be open seven days a week for the run of the exhibition. “‘Frida Kahlo: Appearances Can Be Deceiving’ is the largest U.S. exhibition in ten years devoted to the iconic painter and the first in the United States to display a collection of her clothing and other personal possessions, which were rediscovered and inventoried in 2004 after being locked away since Kahlo’s death, in 1954. They are displayed alongside important paintings, drawings, and photographs from the celebrated Jacques and Natasha Gelman Collection of 20th Century Mexican Art, as well as related historical film and ephemera. To highlight the collecting interests of Kahlo and her husband, muralist Diego Rivera, works from our extensive holdings of Mesoamerican art are also included. 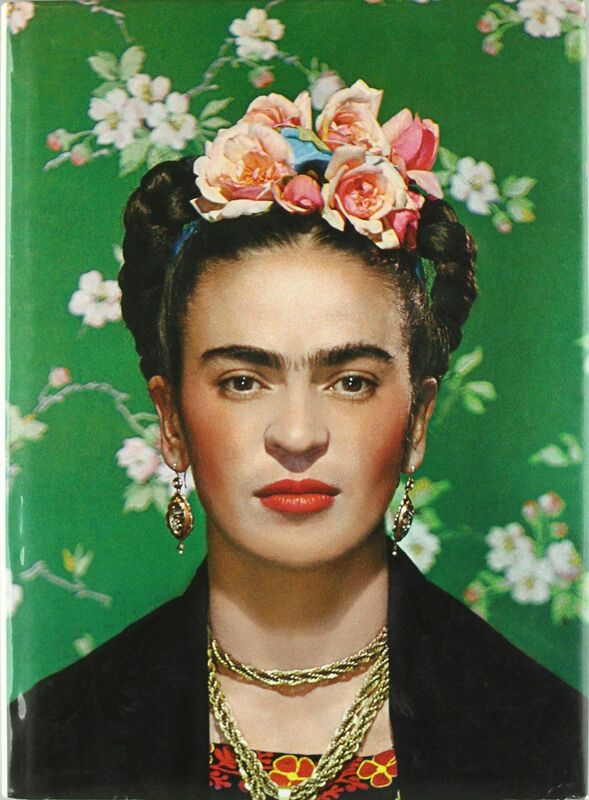 *Wonderful Readers: As of today, there are 19 more posts on Frida Kahlo on this blog, Lisa’s History Room. To see them, click here. At the start of the French Revolution, the market women of Paris, hungry for bread, marched by the thousands to Versailles to confront King Louis XVI and his government over rising food prices and food shortages. Surprising everyone, their demands were met and, in addition, they convinced the royal family—including Queen Marie Antoinette—to relocate to the French capital city. Working class women had never before demonstrated such political clout. 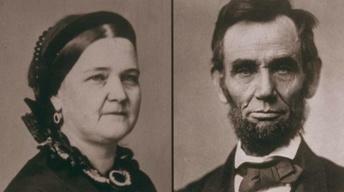 These women were hailed as sisters of the Revolution and were invited to important political events. 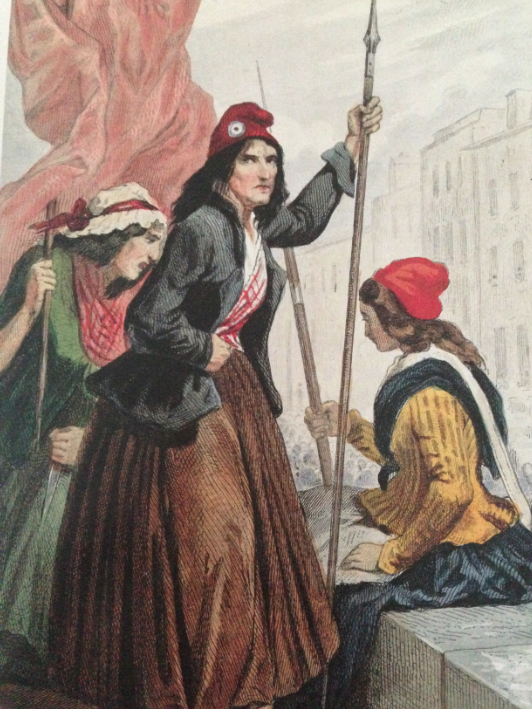 These “mothers of the revolution,” or “bonnes citoyennes,” became overnight heroines for the cause of liberty. They came to be known as the knitting women, or tricoteuses (pronounced trick uh TUZZ). Over time, though, the tricoteuses grew swollen with power and inflamed by the fury of the Revolution. 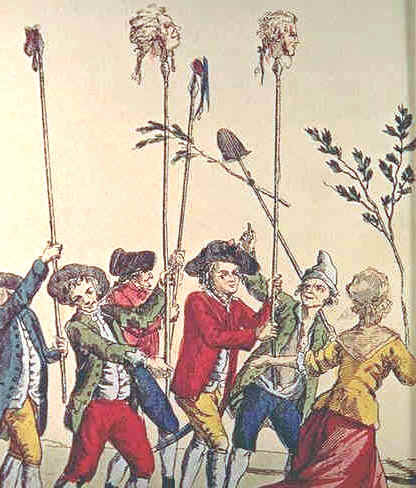 They became rowdy and blood-thirsty, harassing aristocrats in the street, insulting them and urging the radical sans-culottes, or lower class militants, to carry out dreadful atrocities against them. The tricoteuses were like the Greek furies that punished culprits they thought were guilty by hounding them relentlessly. The behavior of the tricoteuses became so dangerous that they became a liability to the more authoritarian revolutionary government. On May 21, 1793, the women were banished from government proceedings. Later that week, they were forbidden from forming any political assembly. The tricoteuses were reduced to hanging around the guillotine. 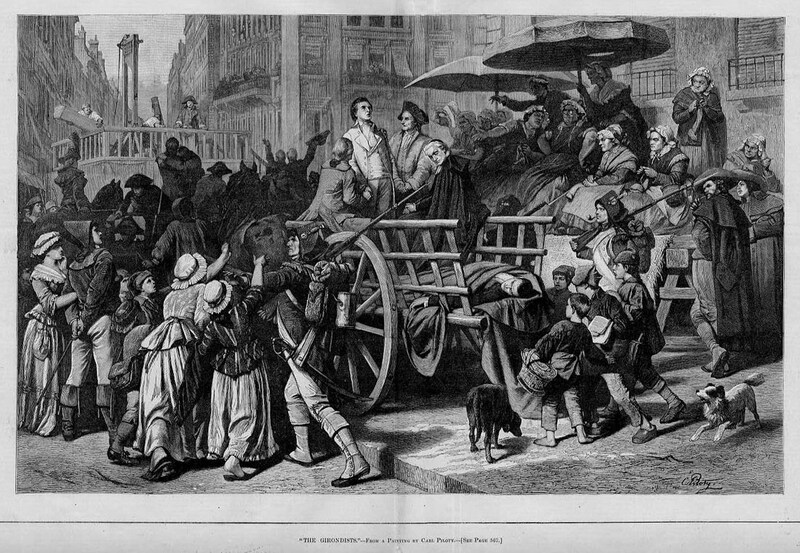 They were the ghoulish women who sat and knitted while the public executions took place during the French Revolution (1789-1799). Many knitted liberty caps, their sharp needles clackety-clacking, while head after head fell beneath the blade and into the basket. Charles Dickens popularized the tricoteuses in The Tale of Two Cities (1859), set in London and Paris before and during the French Revolution and the Reign of Terror. One of the main villains of the novel is Madame Defarge, a tricoteuse, a French Revolution fanatic obsessed with the extermination of real and imagined enemies of the Revolution. She knits and her knitting secretly encodes the names of people to be killed. **Read more about the French Revolution and Marie Antoinette here. The Telegraph: "QI: How Knitting was Used as Code in WW2"
Timeline: "Horror Spectators: The Lady Revolutionaries who Calmly Knit During Executions"
Geri Walton: "Tricoteuses: Knitting Women of the Guillotine"